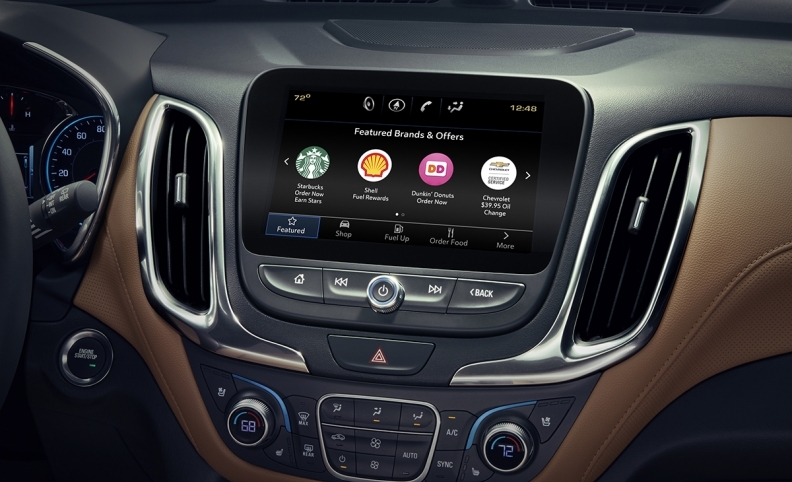 General Motors Canada doesn’t have immediate plans to offer Canadians its Marketplace app, which allows occupants to make in-car purchases such as coffee through the vehicle's infotainment system. Instead, General Motors is launching the new in-vehicle app in the United States first. It will allow drivers to pay for goods such as gasoline or coffee and schedule service through their infotainment systems instead of their smartphone. The automaker expects the free technology, which it is calling an industry first, to quickly expand from about a dozen offerings -- such as ordering from coffee shops like Dunkin’ Donuts or reserving a table at TGI Friday’s restaurant -- to other services such as Starbucks orders and dealership services, including oil changes. Some services such as ordering Dunkin' Donuts for pick up require drivers to have an account or profile with the store. Marketplace uses recent and favourite foods and settings from the profiles to customize the offerings for the driver. GM expects the number of Marketplace-capable vehicles in the Unites States to increase from about 1.9 million today to about four million by the end of next year.